Birds of all kinds, including hummingbirds, see a continuation of the forest reflected in a window, particularly at certains times of day and location of the sun; and they unwittingly fly into it. They do not see or recognize glass as a barrier. A severe head-on collision often results in brain bleeding and neurological damage even if the bird is somehow able to fly off on its own. If so, it will die shortly. More likely you find that bird on its back and bleeding from the mouth, or its neck will appear broken; and it will have labored breathing. In that case place it in a small box in a protected place, cover it, and let it humanely die. 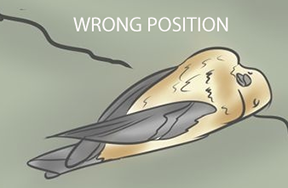 However, if the bird’s condition is not so dire, follow the protocol below that will give it the best possible chance of surviving a window collision. NOTE: A bird’s beak — especially longer beaks — will often hit the window first, forcing the head up and allowing the chest to take the brunt of the collision. The collision literally knocks the wind out of them! When you HEAR a bird hit a window, time is of the essence! Rush to the aid of the bird. Pick the bird up in your hands; it may be semi-conscious and fluttering although many if not most crash victims will be found on their back looking quite dead. No matter, PICK THE BIRD UP and immediately turn the bird right-side-up in your hand so that its body is properly oriented. It needs this upright orientation (feet down, wings & back up) for proper neurological functioning. Gently close your hands around the bird and place it in a confined space for a period of time to help it recuperate. NOTE: Nearly all birds left on their back will die quickly even if they are still alive at first. There is no reviving them after even a few minutes of being on their backs. I keep a 10×12-inch clear plastic container handy that is always refurbished and ready be placed into rescue service. It comes with a vented top and is designed to transport small animals. You can purchase one at many pet stores. I prefer such a container, as it allows me to monitor the bird from a distance. CONTAINER SET-UP: Place several layers of paper towels in the container, and a small leafless branch securely wedged in place that can be used by a bird once it starts moving about. Also place in the container a multi-folded piece of cotton fabric to lay the injured bird on that will support its head and body in an upright position while regaining consciousness. Immediately position the incapacitated bird right-side-up with its head and beak propped up on the upper fold of the cloth. Make sure its legs are not in a distorted position. After it is positioned properly in the container, close the vented lid and let it rest in peace with a towel partially draped over the container to minimize light. NOTE: Never try to feed an incapacitated bird or use a dropper to give it water. And never try to medicate. Put the container in a safe place out of the sun (and away from any pets) and monitor the bird’s progress. Avoid making noise or sudden movements that might disturb it. REST is the magic tonic! The bird will need a minimum of a half-hour of quiet recovery time, and some will need an hour or more. I determine this by the behavior of the reviving bird. If it flutters around banging itself against the walls of the container towards the end of the recovery period I may let it go sooner if I think it might hurt itself. Most birds, however, recuperate more slowly while regaining their strength. Remember, adequate confinement time is vital for their recovery. Some birds may even experience a loss of functioning in one or the other foot as a result of crashing into the window; but if the leg is not broken then the flacid foot is probably only temporary and it should regain functionality in due time. In such cases I keep the bird confined for closer to one hour to make sure it is not listing to one side or showing evidence of other disability as it flits about the container. I will release it once I see that it can stand comfortably on both legs and its feet can firmly grasp the branch that I have placed in the container with it. I also look to see that its wings are normally functioning. Outside release is easy: put the container on the ground (or picnic table, etc.) and gently lift the top off the container. Let the bird determine when and how to exit. It is a very good sign if it flies in a straightforward manner to the protection of nearby trees. RESCUE EXAMPLE #1: A very young Yellow-bellied Sapsucker (pictured above) suffered a window collision and was already on its back when I got to him just seconds later. At that point his beak was partly open and his body was totally flacid with eyes half-closed. I immediately turned him over in my hand and propped him right-side-up in my pre-set rescue container. In his case I removed any branch because he was too large to make use of it in the small container. Within an hour his eyes became oriented, his breathing returned to normal and he began moving around the container on his own, albiet a bit clumsily at first. I let him recover in the container for about an hour before releasing him, being careful not to let him panic and injure himself more in the process. 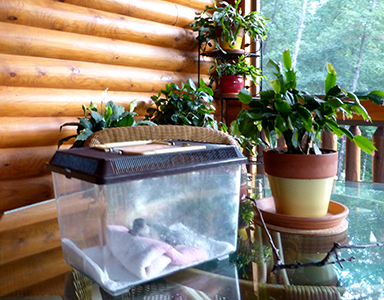 RESCUE EXAMPLE #2: Two hummingbirds abruptly collided with our deck windows. As hummers are wont to do, they chased each other right smack into the window. I heard the collision and I found them lying close together on the deck, ON THEIR BACKS (which is typical). I put them both into the same container in propped up fashion and within a 1/2 hour they had almost fully regained normal functioning. One was more alert and ready to go than the other was, so I released him first…and waited another 20-minutes or so until the 2nd one was also ready to go. Catching a bird inside the container takes practice. Be gentle but resolved so as not to induce panic. Allow them adequate time to recover. The birds will thank you! #1 Installing permanent window screens is by far the most bird-friendly thing you can to do to your home. #2 Large expanses of glass, as in picture windows, are not bird-friendly unless you take extra precautions to add collision-inhibitors in front of the glass. #3 Do not place bird feeders where there are large expanses of glass. The errant bird will inevitably crash into any window but not nearly so often as they would when there are feeders close by. #4 Hanging feeders in front of screened-in porches or screened windows is a much kinder location for them. This includes hummingbird feeders. Hanging them on short feeder poles in a flower garden or anywhere else away from the house is also much more humane. This is my RECOMMENDED SOLUTION for all sizes of custom residential windows, including glass sliding doors. 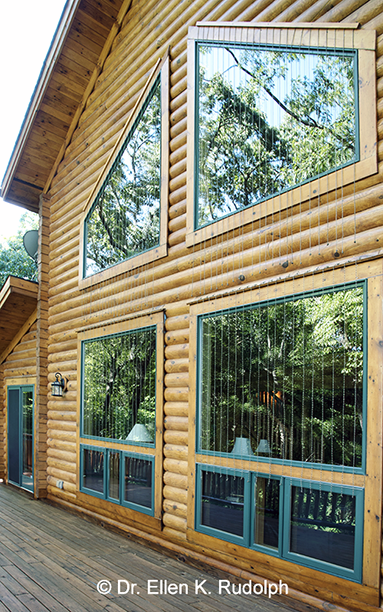 Many windows in log homes, in particular, are over-sized or even odd-sized. Many top brand installable window screens are rarely available for these kinds of situations. Click here to download a PDF of the report by Dr. Daniel Klem, Jr.: “Evaluating the Effectiveness of Acopian BirdSavers to Deter or Prevent Bird-Glass Collisions”. The image below shows you how the birdsaver solution looks on four expansive windows that overlook my deck in the Smoky Mountains. Since their installation 6 months ago there have been zero (did I say zero?) bird crashes at these windows. They are a godsend for log home structures! An online resource called THE BIRD SCREEN COMPANY sells custom bird screens for residential windows. They significantly reduce window collisions by placing a flexible barrier between the birds and the window pane. The bird screen (with included tools and brackets) is held 3-inches away from the window to buffer the impact of a collision. A larger bird like a Sap Sucker may still hit the window with the screen in place, but the collision will rarely belethal. Smaller birds will just bounce off the screen unhurt. This product is useful for vulnerable windows where screens are needed but are not readily available; glass patio doors, large regularly shaped picture windows that are in easy reach using an A-Frame ladder. The screen is almost invisible from inside your house looking out, and they are beautifully engineered. They do require maintenance to keep adequate tension in the screens. The screen/suction cup combo is susceptible to displacement by wind gusts. And the suction cups also need to be replaced after a year of constant all-season use. (See the Suction Cup Superstore). ABC BIRDTAPE for your windows is another resource for homeowners. This tape, properly applied, keeps birds from flying into glass by presenting a visible barrier that birds can see from a distance. It is available from American Bird Conservancy (ABC) which is a 501(c)(3) not-for-profit organization whose mission is to “conserve native birds and their habitats throughout the Americas.” ABC BirdTape is made possible (and affordable!) with the generous help of the Rusinow Family Foundation. Follow their installation directions carefully. NOTE: it is v-e-r-y sticky tape, which makes removal difficult, especially if you leave it on for an extended period of time. I understand that they are working on a less sticky option; until such time I would exercise caution and use on smaller, easily reachable windows. 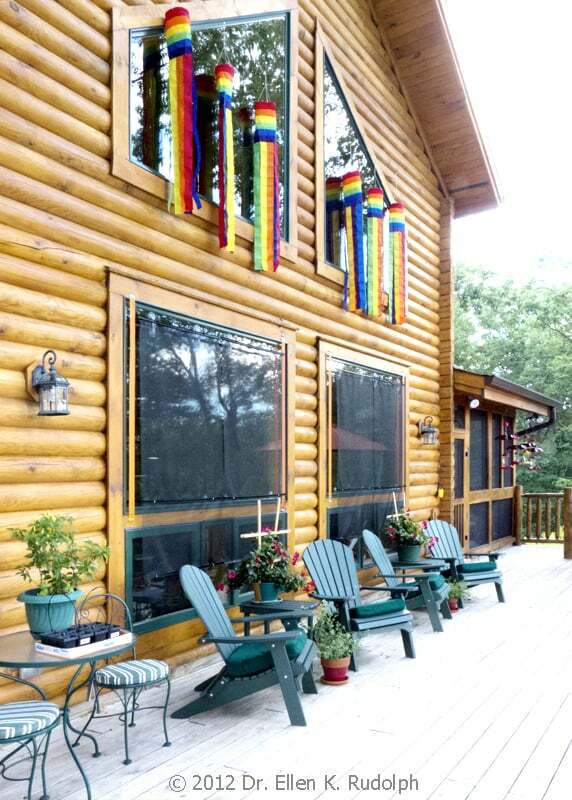 You can also put movable objects around and in front of larger window expanses such as long colorful WINDSOCKS that will flutter in the wind, thereby deterring birds from flying into your windows. Make sure they are of taffeta nylon construction, wind and weather-resistent and hemmed for extra durability. You can usually buy them in packs of three or four or more. I used these windsocks for a number of years on our higher deck windows, in conjunction with CUSTOM BIRD SCREENS (see above) on the lower windows. This was no easy project that involved stringing heavy cabling across the Eastern face of the house, and using tall extension ladders, and nut-and-bolt clips to keep the windsoxs equidistant from each other. They can be troublesome to fiddle with! They are, however, very festive and they tend to be constantly in motion. Window decals are not particularly effective in preventing bird crashes, and I do not recommend them. They mainly just give homeowners a false sense of security. In my experience they loose their effectiveness within a short time of constant exposure to sun and other element. Therefore they must be regularly replaced. They also need to be placed no more than 4-inches a part in order to have any effectiveness at all. Few people know to do this, and the directions on decal packaging do not say this.